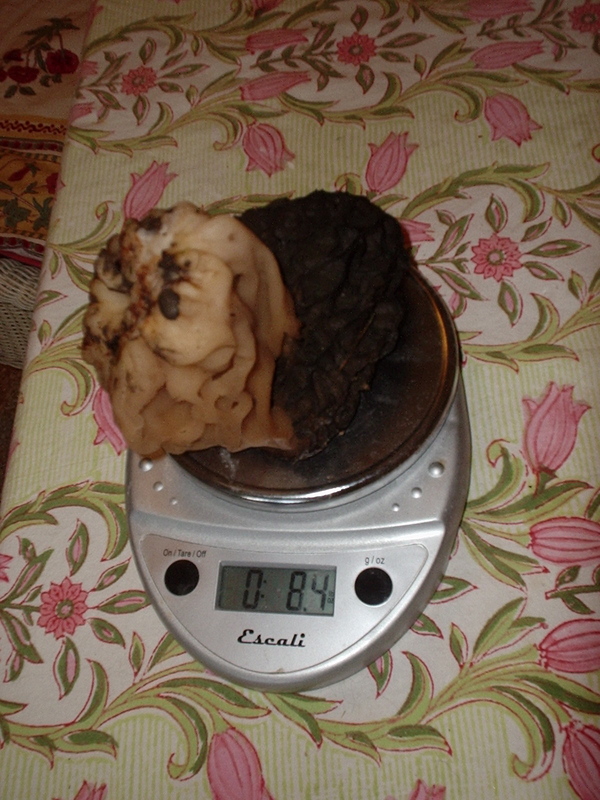 Yes folks, that’s an 8.4 ounce morel! Chuck found it up behind his cabin yesterday morning, growing just at the waterline of the irrigation ditch. It was a monster, but we managed to slay it, cook it in butter and vermouth, and enjoy it on rice (along with some pork chops) last night. It’s the only place we’ve had any luck this year at all, up behind his cabin. He found a couple of really little yellow morels, and one other black one, not nearly so big as this. It did rain a little this week, so here’s hoping the weekend brings us some luck with the wily morel. Dangit… didn’t you get my message NOT to write about morels?????? You people are KILLING me!!!!!! I really am trying to be happy for you. This isn’t related to your amazing morel find, but just wanted to say how much I enjoy your blog. I too survived a PhD program that wasn’t a good fit, ran away from academia, etc.